Zoology Sampling There are 16 products. 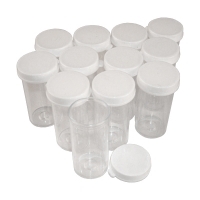 Clear plastic vials meet FDA standards and have tight-fitting, snap-on caps with thumb tab. 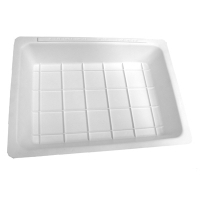 Gridded Pan Liner (shown in image), which marks off 15 clearly visible 5 cm grids when placed in our heavy duty pan. 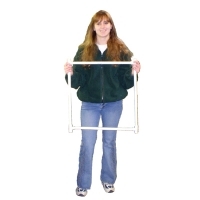 Quantify the results of your field study with our folding sampling square. This plastic device cleanly and quickly marks off your sampling area on land or in water. It snaps open with a durable shock cord inside the PVC legs. Connections are made with T-connectors which allow the frame to sink in water. Collapsible for transport and storage. Comes with instructions. Image may vary. 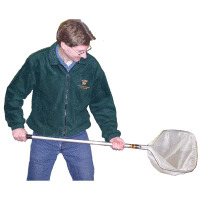 This sturdy D-frame net is ideal for sampling in streams. Its lightweight aluminum handle, 36" long, is easy to wield in the field. It features an 18" deep cone section, 11-12" x 12" hoop, and mesh size of 800-1,200 micron. Replacement nets are available. This item ships oversize. Oversize fees will be added to your shipping.